Even during this time of the year, when I prefer to eat mince pies for breakfast, I still like to work in a salad every now and then. And as always, I like my salads to have lots of flavour and texture. That way a ‘boring’ salad is more satisfying and less bland. I’m a big fan of roasted butternut squash and work it into recipes often. I love that it infuses anything you add it to with its creamy sweetness. 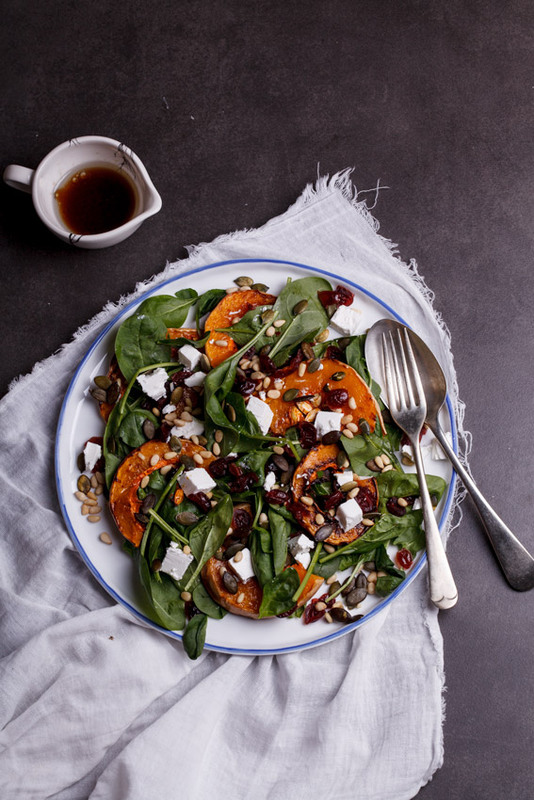 So I decided to make wedges of roasted butternut the star of this salad and chose the other toppings because of the way they so beautifully compliment our beloved butternut. Of course Goat’s cheese was the first cheese I though of when trying to figure out which cheese to use with butternut but that has been done to death so I was looking for an alternative. I still wanted that salty yet softness you get with goat’s cheese and that’s when I decided to use Danish feta instead. It’s a little firmer then the soft goat’s cheese I usually use and it also adds a slight brineyness to the salad. 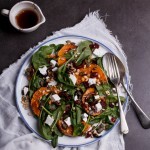 Add to that sweet cranberries soaked in hot water until they are juicy and plump, a mixture of pine nuts and pumpkin seeds which have been toasted and a delicious zesty dressing and you have a pretty fantastic salad. This would also be the most delicious side dish for your Christmas meal but personally I’m saving this one for Boxing day when I’ll be serving it with some left-over gammon and a few loaves of fresh bread. Which reminds me, it’s 10 days till Christmas!! TEN DAYS!! I have officially become shouty because CHRISTMAS!! I can.not.wait. What have you got planned? 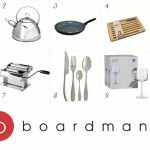 Are you preparing a glorious feast? I want to hear all about it. 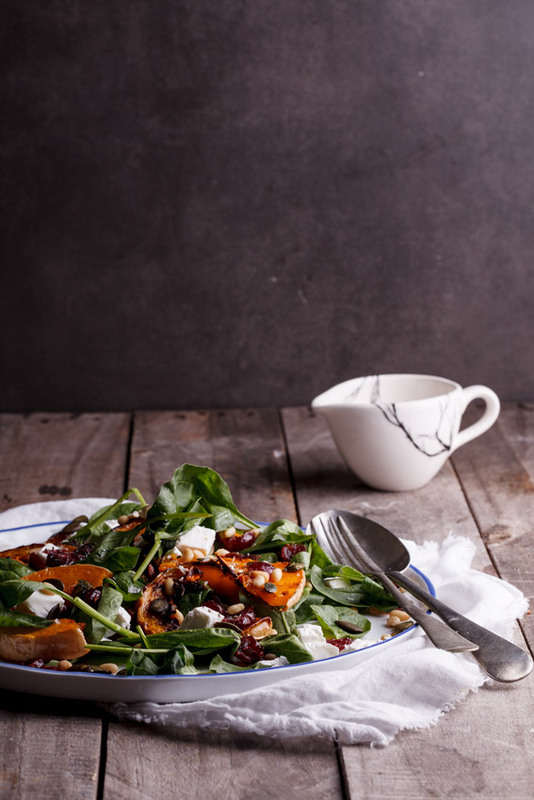 Place the butternut on a baking sheet then drizzle with olive oil and season to taste. Place in the oven and allow to roast for 15-20 minutes until golden brown and cooked through. In a frying pan, toast the pine nuts and pumpkin seeds until golden brown and fragrant. 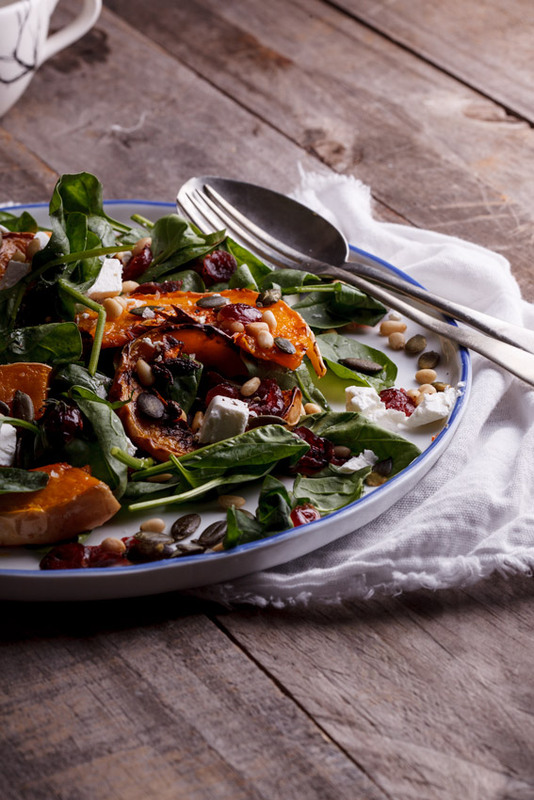 Arrange the baby spinach leaves, roasted butternut, cranberries, nuts, seeds and feta cheese on a large platter. 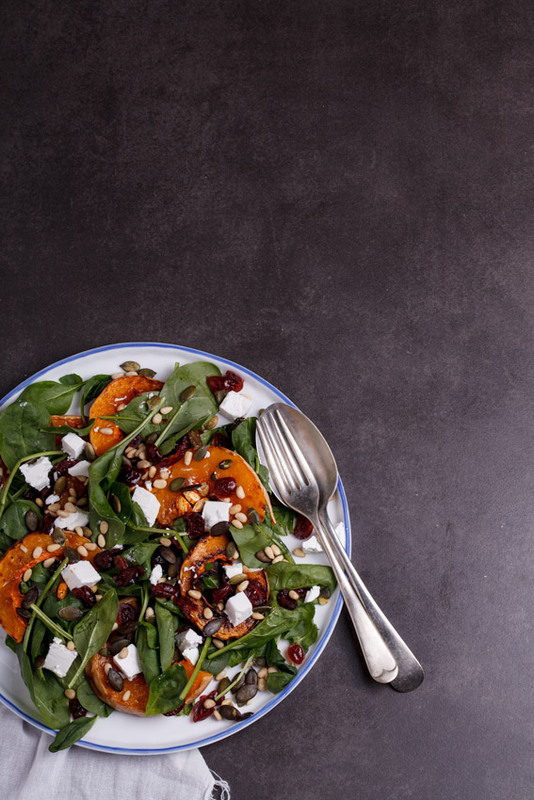 For the dressing, whisk together all the ingredients then pour over the salad and serve immediately.